Handout is available with full-color in-mold labeling (above) or in a clear plastic to allow consumers to see inside. This is the first market-ready out to share candy packaging solution. It's a success for brand owners and consumers. Perimeter Brand Packaging has announced the launch of a new, market-ready candy packaging solution, called Handout, that is designed to increase on-shelf visibility, brand recognition, purchase intent and candy consumption. Based on consumer insights relating to the social nature of sharing candy, Handout is designed to be left "out to share" and promotes increased consumption. The in-mold labeling (IML) capabilities give candy manufacturers a powerful 5"x16" branding billboard. "We believe this is the first market-ready out to share candy packaging solution," said Steve Callahan, President of Perimeter Brand Packaging. "It's a success for brand owners and consumers." In conjunction with ORC International, a global market research firm, Perimeter's Consumer Insights team conducted a study among 1,000 consumers. The study revealed that consumers expected to consume up to 89% more from Handout versus traditional bagged candy. Likewise, the out to share design increased consumption frequency of family and friends. Consumers said Handout would lead them to more usage occasions, like sharing at their workplace or using it as a gift. 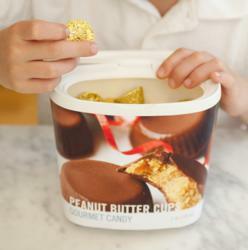 Overall, they said the package was appealing because it is unique, looks appetizing, serves as its own candy bowl, will keep their candy fresh and is refillable. The visual appeal and billboard of Handout also played a significant role in increasing purchase intent at retail. The study concluded that the customizable IML graphics significantly increases on-shelf visibility and brand recognition and builds a premium appeal. The full-color IML graphics not only allow for strong brand reinforcement, but also seasonal patterns. The polypropylene tub is 100% recyclable and is available in clear plastic to allow consumers to see the contents inside. "Handout creates a new platform for seasonal candy packaging and increases merchandising opportunities for both on-shelf and seasonal promotional displays," said Callahan. Handout is a market-ready packaging solution. Like all products from Perimeter Brand Packaging, Handout was designed for "speed to volume" manufacturing and is validated by consumers. Perimeter's research revealed applications for the use of Handout with other products, but the study has proven that the product really hits the sweet spot for the growing candy industry. For more information, visit perimeterbp.com or call 508.466.8430. Located in Northborough, MA, Perimeter Brand Packaging is an Open Innovation partner to leading Consumer Packaged Goods (CPG) companies. Perimeter complements customers' innovation goals by delivering superior, market-ready packaging - driven by consumer validation. As a Nypro company, Perimeter leverages best in class manufacturing capabilities to deliver these finished solutions to customers around the globe. To learn more, visit perimeterbp.com.